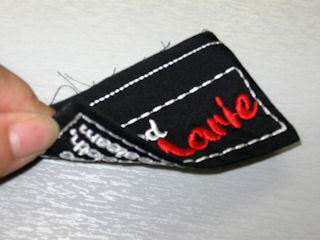 Customizable Clothes Labels In The Hoop! 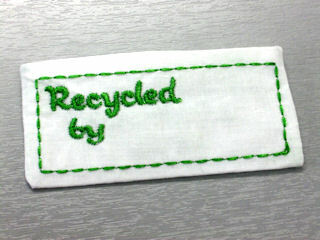 Fantastic labels for clothes, quilts, recycling and other projects. Very quick to make for very little money invested! 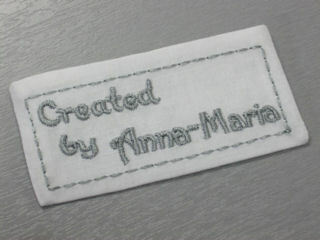 - Dedicated to the members of the My Embroidery Haven forum who can't ever, ever stop imagining! 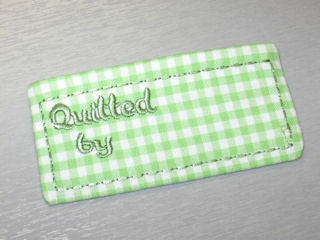 If you are a sewer, quilter, embroiderer, knitter, etc... This collection of customizable labels is for you. 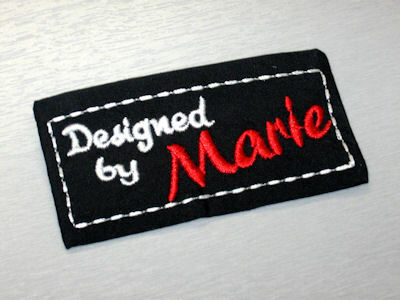 They take a few minutes to make and create a dramatic and professional look for all of your creations. There are 6 different labels included. 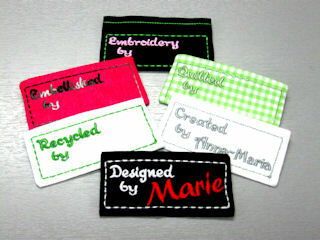 You have the choice of "Created by", "Embroidery by", "Quilted by", "Embellished by", "Recycled by" and "Designed by". Each of the labels is already digitized exactly as they are shown in the photos. 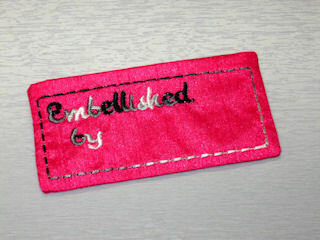 A space has been left to allow you to include a word or name to suit your needs each time you want to use a label. 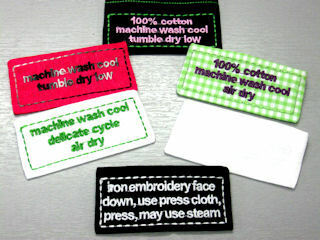 Each of the labels has been included with the back either blank or 5 different care instructions as listed below. the seam of a garment or project. is not included in the set. 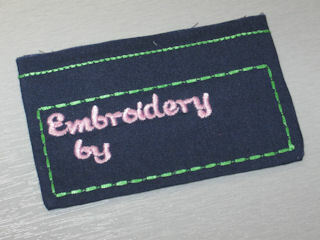 are embroidered all in one hooping. making them longer and easier to cut. The raw edge at the top can also be turned in if needed. A very detailed instruction file with photos at every step is included with the designs. 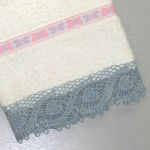 Specialty threads can be used to create effects. 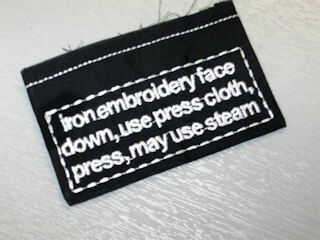 Don't hesitate to use different fabrics. Gingham, for example, is just too cute by far.
" I'm doing good for the environment "
to allow more creative freedom. has been inserted but is not included. 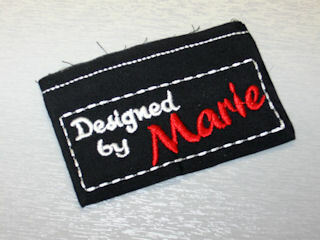 Finished Label Size: 3 1/4" x 1 1/2"
Use the option here at the bottom right of this page under "Available Options". 1. Select the font of your choice. 2. Select your preferred machine format. 3. Select how many words or names you need digitized for you. 4. When all your selections are made, click ADD TO CART. 5. If you are done with your shopping, Go to CHECK OUT. 6. When you reach the "Payment Information" page, select your payment method, scroll down to the last box "Add Comments About Your Order". Type in the word or name of your choice. DO NOT EVER enter characters such as " & # $ % ^ *( ) etc... as it will cause the system not to read your entry properly. If one of those characters is a must, write it instead. For example, . becomes dot or @ becomes at. PLEASE make sure the spelling is accurate before completing your order. NOTE: If you would like to use a different font for each of the words, type the number of the font, leave a space, then the word, leave a space again and type in the second font plus a space then the word. 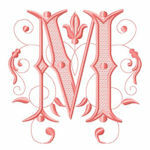 Usual delivery delay for the custom digitizing of one word is 72 hours. Don't forget to choose your machine format! 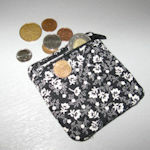 Even if you don't require additional digitizing.